Presumably Theresa May, our Prime Minister, eats lots of crisps, perhaps as she considers Article 50, her finger hovering gently over the button. Presumably crisps are the Achilles heel of what appears a well ordered, neat life because we were told last week that the Prime Minister is giving up crisps for Lent. I was delighted to hear it. Not that I have anything against crisp eaters (for my American followers I’m talking about chips!). In fact, I love a bag of crisps. I was fortunate enough growing up in Leicester to be able to go to the Walkers pork shops in the city. They sold wonderful pork pies but they also sold crisps, Walkers crisps. Their pork pies haven’t gone global but the crisps have. Gary Lineker’s family fruit and veg stall was just a short distance in Leicester Market from Walkers’ premier shop. The queues used to be round the block before Christmas as we queued for a big, family sized pie and presumably some crisps. So it’s always been good seeing local boy Gary promoting crisp eating as a national pastime! Giving up things for Lent is of course an important part of the whole discipline of the season. Yes, like many priests, I’ve preached about how its important to take things on, have a positive Lent and not see it simply in negative terms. ‘Read the Bible … go walking … help at a project.’ All those things are good but let’s be honest, giving up something we enjoy isn’t easy and maybe there’s some virtue in doing something that does challenge our tendency, my tendency, to self indulgence. We can only imagine the pain Mrs May is going through as she opens the door to her well-stocked crisp cupboard knowing she can feast her eyes and not her appetite for those greasy slices of deep fried, heavily flavoured potato. One solution is of course for her to cover the crisp cupboard door in sackcloth. After all, that’s precisely what we do in church. The vergers at Southwark Cathedral spent Calop Monday and Shrove Tuesday taking down the altar frontals and hangings and replacing them with ‘Lent array’. Ours was designed by Sir Ninian Comper, sackcloth on which have been stencilled various symbols, crosses, chi-rho, fleur-de-lis, that kind of thing. They cover up the more splendid decorations, give a fast to the eyes before Easter comes as the feast for the whole person. As Passiontide begins on the Fifth Sunday of Lent the statues and the icons will also be covered, obscuring all that is decorative so that our focus is elsewhere. I had an object lesson the other day as to why its important for clergy to wear a clerical collar (a dog collar) in the street. I was meeting a friend outside one of the many branches of ‘Pret a Manger’ round the Cathedral. There was a young guy standing there as well, dressed for the office. ‘Hello Father’ he said, ‘Have you given anything up for Lent?’ ‘I have’ I replied ‘bread and coffee, which makes me wonder why I’m going to this sandwich and coffee place for lunch!’. He laughed. ‘What have you given up?’ I asked. ‘Chocolate’ he replied ‘I eat far too much of it. But Lent’s longer than forty days and forty nights isn’t it?’ A conversation followed about the season. I didn’t ask him about church – I’m not a very good evangelist, but the conversation was about an outworking of faith and it reminded me how important Lent remains and how the crisp news story might have reminded people of that. But a good Lent involves both crisps and sackcloth, the discipline and the repentance that in fact that Lent array represents in a visual way. A good Lent does involve doing good for the poor and the marginalised, the refugee, the oppressed. A good Lent does involve treading a hard path and occupying something of the wilderness space. Crisps and sackcloth are only the beginning. Those words ‘to fast from strife, from old debate and hate’ are the real challenge. As the debates rage about the implications for our neighbours, colleagues and friends of Brexit, as we seek the restoration of the Dubs amendment so that lone refugee children can be brought to a place of safety, giving up crisps, giving up anything pales into insignificance. For God wants us to keep the true fast, the good Lent and the challenge comes to us from the prophet Isaiah. For the past five week we have been walking, in a virtual way, around the Lent art installation in Southwark Cathedral. The pieces, all by the artist Peter Burke, are made from soil – hence the title we gave them, ‘Earthworks’. I liked that title when it was suggested because it described the pieces but it also took us into the possibility of theological reflection and that is the real point for me. Lent is a time for going deeper, into God, into self, into discipleship and whether it’s through some self imposed discipline, or a study group or reading a Lent book or doing good works or just (and that is no value judgement) looking at art, all these things help us in that aim. But the title worked on another level for me as well. All around Southwark Cathedral there are development and redevelopment sites. The most dramatic have been around the Shard and London Bridge Station but there are many significant building sites a stones throw from the Cathedral. As a lad I often went out with my dad on a Saturday. He was in Building Control but at the weekends was a part-time architect. We’d often go and inspect the progress on a building site. The first stage is of course the ground works, or, lets call them, the earthworks. Getting those right was essential for what was going to be built above. Vast and deep caverns are opened up in the ground to take the buildings around the Cathedral and much is exposed as that happens. In Borough High Street we’ve seen in recent months the foundations of inns from the time of Chaucer, Roman bath complexes, a renaissance palace, all exposed. Digging down produces treasure and helps us build – and that must be part of Lent. The final station on our ‘Earthworks’ journey is at the High Altar where we find an incomplete circle of feet. They emerge and disappear beneath the altar, an ongoing and mysterious circle. Our virtual feet have brought us to this point and now we look at these feet. Where are these feet heading? Where are your feet taking you? What journey are they on? What journey are you on? One of the powerful themes throughout the Bible is that of the journey. We are a pilgrim people, people on the move, ‘with no abiding city’ (Hebrews 13.14). Our father Abraham travelled, Moses and the children of Israel travelled, the exiles to Babylon travelled back to their land of freedom, Jesus spent his ministry on the road. After his resurrection he is on the move again and goes ahead of the disciples, messaging them to follow him. You have travelled round this Cathedral, stopping, looking, thinking, praying and now you arrive at these mysterious feet. We see most of the journey – but not all of it. It seems to disappear, beneath the altar, out of our sight, out of your sight, and we are left wondering – where are these feet heading, what journey are they on and where am I heading? The truth for each of us is that, whilst we may not know the details of the journey, we never travel alone as none of our forebears did. Our God treads this earth from which we were made, accompanies, companions us on the road and pioneers the path ahead. Wherever you go from here – God will go with you – as will this ancient Celtic blessing. This is Passion Sunday. Although the Passion of the Lord is not read on this Sunday, we wait for that until Palm Sunday and the beginning of Holy Week, yet the emphasis changes. It may be that in your church, certainly in Southwark Cathedral, there is an even greater sense of austerity and solemnity. The statues are covered in purple veiling. It is as though the building itself is weeping, as though the whole place is already in mourning. The Lenten fast has even taken the images and the icons and the statues from us. There is nothing to ‘feast’ our eyes on. Instead we are called to look upon Jesus and to enter into the experience not so much of the wilderness, which is where it all began, but enter into the passion itself. Over the past four weeks we’ve been making a virtual journey around the art installation – ‘Earthworks’ that is at present in the Cathedral. The images will be there until Holy Saturday. They are not veiled. Instead there is something very austere about them already. There is nothing sumptuous, nothing gilded, nothing glamorous about them. They are dust and as with us, ultimately to dust they will return. Last week we were looking at the series of heads that are in the retrochoir. As we move past them we come across another standing figure, similar to the one we saw in the distant. But now we are quite close to it. In its starkness we look upon it. The prayer that accompanies the journey which we have called ‘Earthworks’ is this. Is this the same person that you saw on your way into the retrochoir? But now you are closer and can look more closely. Who is this person? The climax of Jesus’ journey to the cross came in the courtyard, the gathering place, the residence of the Governor, Pontius Pilate. The arrest in the Garden of Gethsemane, the subsequent beatings and false accusations had delivered Jesus – broken, bleeding, exhausted – to this place of judgement. Many of those who saw him now had seen him before, but not like this. They had seen him by the lakeside in Galilee and decided to follow him. They had seen him in towns and villages, healing, touching and they had been attracted to him. They had seen him teaching on hillsides and in the Temple and they had listened to him. They had seen him on a donkey entering Jerusalem and had welcomed him. But they had not seen him like this. Above the noise of the crowds, as Jesus reappears wearing the mocking garb of a ‘dress-up’ king, Pilate shouts ‘Ecce Homo’, ‘Behold the man’. And they looked. We have seen this figure before but not like this. Behold the man. Nothing hides him from us. His nakedness has removed any clue we might have had as to who he is. Does that shock you? Does his nakedness in a sacred place offend you? Here is the man, made from the earth, the earthwork of God, and, stripped of all as he is nailed to the cross, Jesus is the man of the earth raised towards heaven. to the glory of heaven. Each year we host an art installation at Southwark Cathedral during Lent and Holy Week which we hope will be a means of helping people enter more fully into the season. This year the works are by Peter Burke, parts of the human anatomy, on a human scale which we’ve collected together and called ‘Earthworks’. The artist has used soil to create them and for people of faith there’s an instant link with this to the creation myths and the way in which we were created from that same soil. Jesus, sharing in our humanity through the self emptying, the humility of the incarnation enters this ‘earthy’ nature. That word humility is in itself an ‘earth’ word, drawing from the Latin for soil, earth. 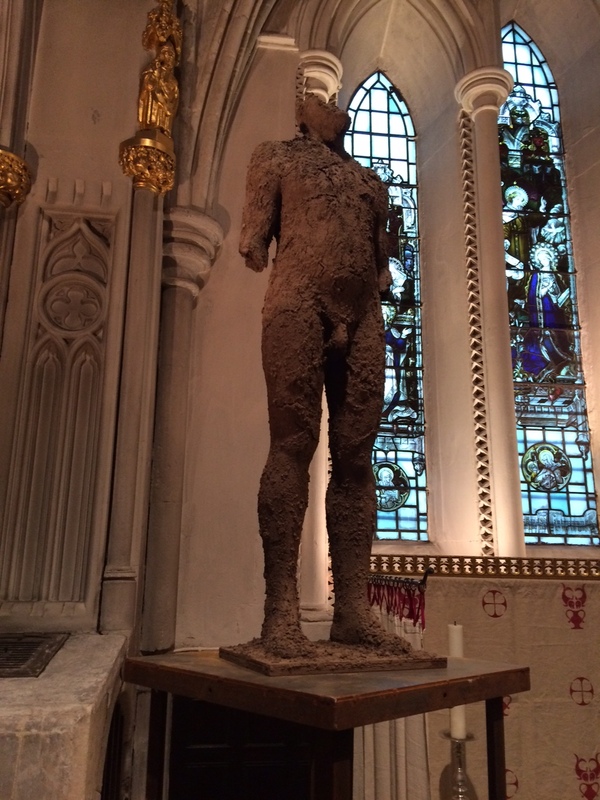 Visitors to Southwark Cathedral are encouraged to make the journey amongst the various elements of the installation. But we can do that virtually as well. So during these weeks of Lent I’ve been sharing my own reflections on what we see. On Palm Sunday evening at 6.00pm we will make the journey together and if you are in London you are very welcome to share in ‘Earthworks’ with me. The prayer that is accompanying the installation is the place we begin. So far we’ve looked at a series of hands in the nave and then, walking towards the retrochoir at the east end of the Cathedral we see a distant figure. Then entering the most ancient and peaceful space (the retrochoir of the Cathedral was the first part to be rebuilt after the devastating Great Fire of Southwark in 1212) we see a series of faces. It’s these that we now contemplate together. Look at these heads? What do they say to you? What mood are they in? Human beings have a wonderful gift of facial recognition. We remember a face, even though we often forget the name and part of the horror of dementia is having this basic human ability taken from us. ‘I know your face’ we say and we do, even though it is composed of the very same elements as every other face that has been created. And faces tell us so much. These faces, cracked, incomplete, perhaps they tell us a variety of stories. Where you get that hair from? Got it from a old tom cat. Give it back then, love. When you look at yourself what do you think, what do you like, what do you despise, what do you see? No one bothered to describe for us what Jesus looked like. Not one of the evangelists, not Matthew, Mark, Luke or John, seemed to think that what Jesus looked like was important. Yet I would love to know. As he journeyed to the cross people saw him, head crowned with thorns, blood running down, perhaps looking nothing like his mother knew him. And when she met him on that Via Dolorosa, when Veronica wiped that face, what did they see and what looked back at them? Perhaps even in all that pain, love looked back at them. That ‘sacred head, sore wounded’ would be raised up. Look at these heads? What do they say to you? What mood are they in? And see yourself as others see you, see yourself as God sees you. Lord, you know me and love me. May I recognise your face in those around me. May I recognise your face when I look at myself.